Mineral King valley. The "V" notch on the left horizon is Farwell Gap, and yes there is a trail over it. John Muir rode over that gap on horseback on his way to Mt. Whitney. Vandever Mountain is to the right of the gap. 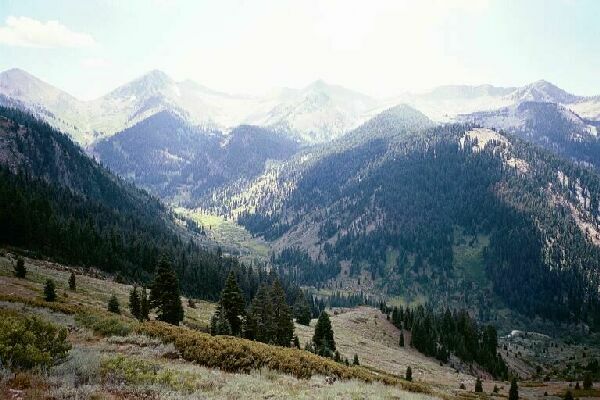 Big 5, Little 5 Lakes Loop and Sawtooth Pass, August 4th to 7th, 2000. I got up unusually early before dawn. I was anxious to get on the road and I had a long ways to go, and the day would prove to be a long one. The drive was uneventful and free of excessive traffic or delays, except for the freeway building at Visalia and its detour and traffic lights. At Three Forks I gassed up and found the road to Mineral King. The Mineral King road is journey all in itself. The road is little more than a single lane of paved track that is unpaved around Silver City. But what makes the road a trip is the number of curves in the road. Someone counted and it was some ridiculous number like 600 curves to Mineral King. I fully believe it because as you drive you are endlessly turning the steering wheel back and forth in the ample supply of tight turns and hairpins. Back and forth, back and forth you turn as you crawl upward and the first time you make the trip you wonder just when the heck you are going to get to where you are going. When you cross the bridge, you are about 1/3 of the way there. The National Park entrance station marks about the half way point. Eventually the road flirts with the bottom end of the Transition Zone, and it is not until you pass two Sequoia's at the side of the road in yet another curve in the road can you be sure you are in the Transition Zone for good. Then the dry scrub and bush is behind you, and you enter the shade of trees and an occasional view up-canyon to Sawtooth Peak. 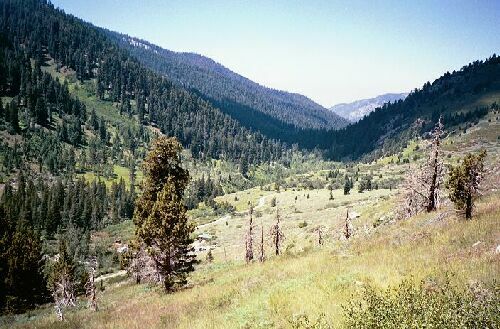 Along the way you will pass another larger grove of Sequoia's, and near Atwell Mill you can gaze mournfully at the gigantic stumps of Sequoia's felled to make grape stakes for the valley below. Protection did not happen soon enough for these fallen giants. When you hit dirt road you know you are nearing Silver City, a great place to pick up some supplies, something to eat, a souvenir (I got a great Silver City tee-shirt), and best of all, a shower, one of the best in the Sierra. It is a great place to hang out or stay overnight in one of their rustic cabins. The road is paved in Silver City, but becomes dirt again just beyond. And by the way, Silver City is a small collection of cabins and an ancient gas pump in front of the country style store. Looking back towards the entrance to Mineral King. See the road? There is about a billion switchbacks back that way. At last I pulled into the parking lot of the Ranger Station and waited in line for a permit. After a spirited discussion about my Ursack bear-proof bag, I was ready to hit the trail. Up the road a ways the trees vanish and give you great open views of your surroundings. Where the road turns up canyon is the parking lot and unhelpful signage. I had to pull out my 7.5 map to make sure I found the right trailhead. On the trail at last! I was on the trail at about 11:30 AM. It was warming up fast but God and Nature decided to bless me with a few scattered clouds to shade my way, which I was grateful for in the rising heat. The first switchback section is steep and lives up to its Mineral King reputation of steep mining trails. When the trail switched back north it was almost level for a considerable distance.